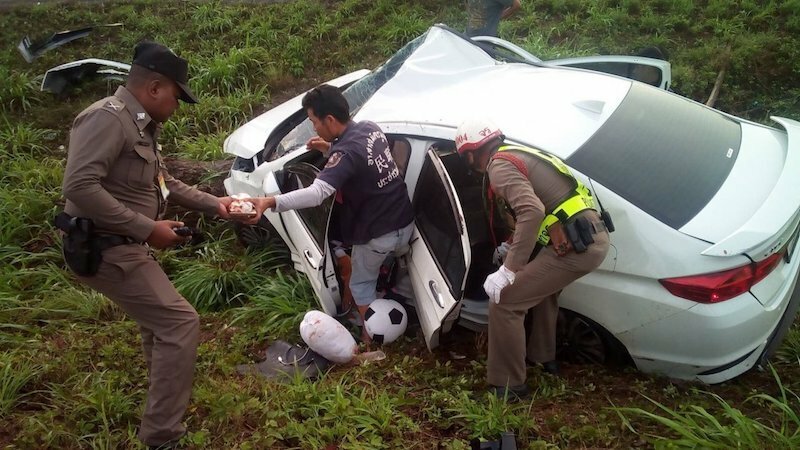 Chiang Mai had the most accidents at 119 and Nakhon Si Thammarat had the most casualties at 126. Nakhon Ratchasima and Udon Thani shared the top spot for deaths with 15 each, Probation Department chief Prasarn Mahaleetrakul announced. Only five provinces, Trang, Phang Nga, Mae Hong Son, Sukhothai and Angthong, reported no Songkran road deaths. On Tuesday alone, there were 367 crashes claiming 42 lives and injuring 381 others. Speeding was blamed for 30 per cent of accidents and drink driving for 28 per cent. On Tuesday, 65,375 officials and volunteers manning 2,040 checkpoints nationwide said they checked 1,048,847 vehicles, resulting in 239,295 motorists and motorcyclists being charged with traffic violations. Most cases involved riding motorbikes without wearing a helmet with 64,829 incidents and failing to present a driver's licences, 57,087 cases. Prasarn said the Thai courts had placed 8,642 alleged offenders in the probation system from April 11-16. She said 98 per cent or 8,481 of the cases involved drink driving followed by 150 cases of driving on drugs and 11 cases of reckless driving. The most drink drivers were arrested in Maha Sarakham (596), Bangkok (480) and Nakhon Phanom (440), he added. In a separate press conference, National Council for Peace and Order (NCPO) spokeswoman Col Sirichan Ngathong said that army, police and administrators had confiscated 6,435 vehicles (4,752 motorbikes and 1,683 cars and trucks) and 2,291 driving licences from drink drivers during April 11-16. Throughout this period, officers found 177,134 motorcyclists and 146,017 motorists violated traffic laws and prosecuted 131,674 motorcyclists and 91,499 motorists, she added. Ok, thats on the roads but I wonder how many deaths and injuries due to violence? Strange that these figures are published. Thailand is such a squared away country, best in the world. I would imagine most accidents are caused by Thais thinking about farangs than loosing control. I.e Farang no good is to blame! In a separate press conference, National Council for Peace and Order (NCPO) spokeswoman Col Sirichan Ngathong said that army, police and administrators had confiscated 6,435 vehicles (4,752 motorbikes and 1,683 cars and trucks) and 2,291 driving licences from drink drivers during April 11-16. The NCPO army should not have anything to do with this and that is where Thai people need to draw the line and separate Military and domestic services. 30% speeding, 28% drunk....what were the causes of the other 42% anyone please? what were the causes of the other 42% anyone please? This is like reading a sports recap. Very strange. =Drugs, mental illness, low IQ or all three of them. drink, sleeping, lack of ability to drive/think/judge anything/look ahead, turn/drive in a straight line/see anything past 20 feet in front of the car/look in the mirrors; the possible list is almost endless. Ultimately, it all boils down to one thing: stupidity. Quoting National stereotypes is always a difficult, sensitive and contentious area, but I actually think that it is a National trait that Thais just don't have any well developed sense of spacial awareness. Couple that with a general lack of interest in doing anything to a particularly high standard, a lack of personal responsibility for their actions and poor education in almost every aspect of daily living and you have the basis for what we see on the roads. Why? Do you know something we don't? the average seven day death toll on thai roads is 462, so 348 deaths on the seven songkran days makes the holiday a comparatively safe time to travel. not that the figures aren't horrific.